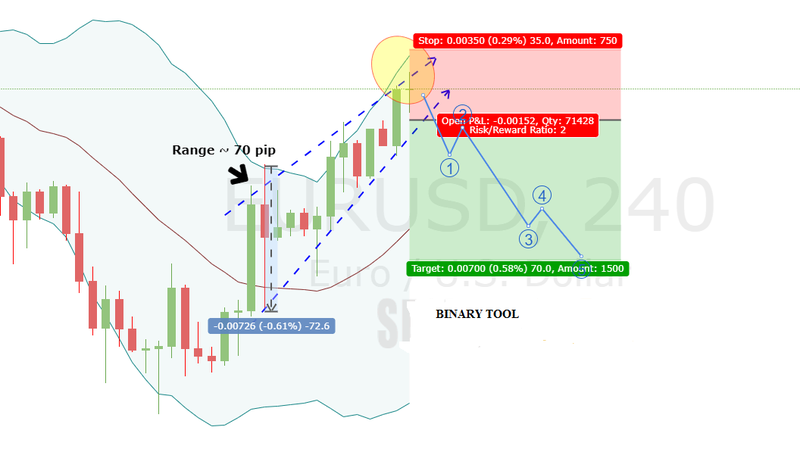 Studying price patterns has become one of the popular choices for traders to get trading signals directly from price movements on the Chart. 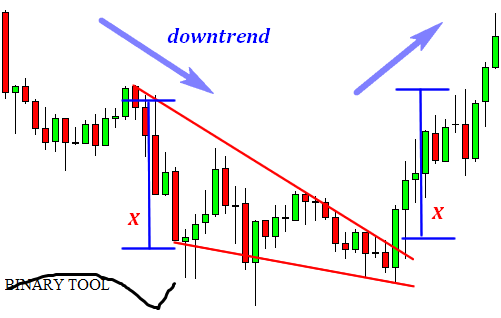 Examples of these price patterns include the Rising Wedge pattern and the Falling Wedge pattern. Both of these price patterns can be easily recognized and promise profitable trading opportunities. 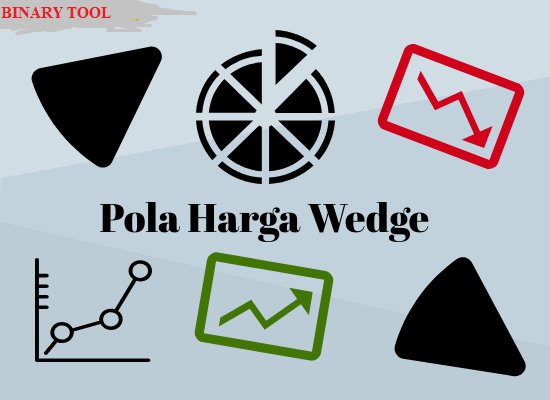 What is a Wedge Price Pattern? The Wedge price pattern is similar to the Triangle and Pennant patterns. Basically, these patterns highlight conical price movements. The indication is that the strength between the seller and the buyer is consolidating (equally strong, but the volume usually decreases), with high potential to experience a breakout in one direction. Visually, the Wedge price pattern is like a slice of a circle. If the "slice" faces up, the term is Rising Wedge. Whereas if the "slice" bends down, the name is the Falling Wedge. The Rising Wedge pattern appears when the market consolidates with the Support line slope angle steeper than the Resistance line, so that the low price (Low) increases faster than the high (High) value. Although at a glance the price seems to continue to rise, but the pattern of the Rising Wedge price indicates that the momentum of the climbing trend is getting weaker. That is, the volume is getting thinner. If this pattern is formed during an Uptrend, the price has the potential to turn plunge. Whereas if it is formed along the downward trend, the biggest possibility is that the price will resume its decline. 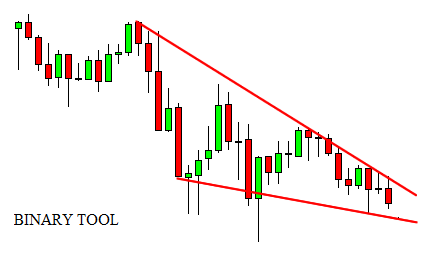 Contrary to the Rising wedge, the Falling Wedge pattern appears when the market consolidates down with the Resistance line steeper than the Support line. So, the high value (High) is always faster than the low (Low). If this pattern forms during a downtrend, then the price has the potential to return to skyrocket. When formed along a climbing trend, the biggest possibility is that the price will continue to rise. 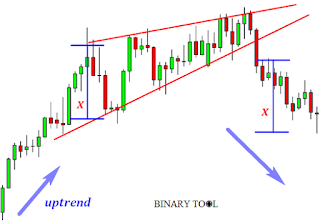 What is the Wedge Pattern Trading Strategy? Planning a trading execution based on the appearance of the Rising Wedge pattern or the Falling Wedge pattern can be done in a simple way. Beginner traders can use it as long as they follow the exact trading steps. First, identification of price pattern formation. 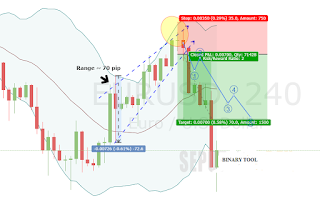 This initial step can be done on all types of Forex and Timeframe Pair, but it is recommended to study in the Major and Timeframe Hourly Pair to the Daily first until you get used to it. 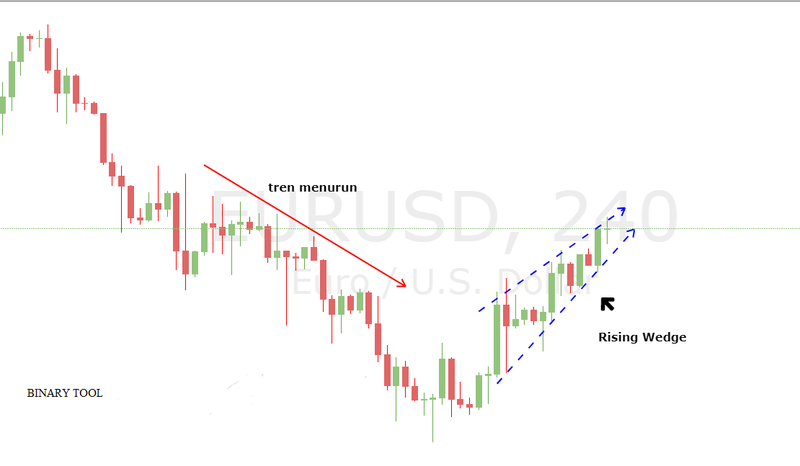 On the EUR / USD (H4) chart above, the Rising Wedge pattern is identified from a Low candle which is faster than the high price. This pattern of climbing slices is formed when the trend decreases, meaning that the price has the potential to plunge back. Remember, the keyword here is "potential", because it is still not necessarily true, we need to find a way to ensure its accuracy. The second step, the signal confirmation from the Rising Wedge pattern or the Falling Wedge pattern with the help of other indicators. Supporting indicators are useful for increasing the validity of the slice price pattern signal. From the picture above, the Bollinger Bands indicator supports Bearish signals from the Rising Wedge pattern, because a Doji candle is formed near the Upper Band. That is, the Buyer starts to feel hesitant to push prices further. Third, determine the target profit and loss limit. After being sure of the validity of the trading signal, you need to set at what level the position will be closed, and how much risk is ready to bear if the price moves beyond expectations. Generally, the target profit on the Falling Wedge or Rising Wedge pattern can be determined by the range of the Low value to High at the beginning of the "slice" or the longest candle range in the canal. 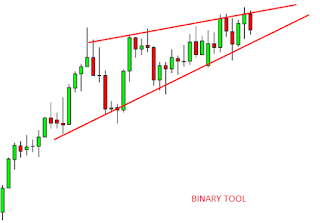 From the same chart, it is known that the longest candle range in the Rising Wedge pattern is around 70 pips. Next, the loss limit can be determined according to the Risk and Reward ratios or placed near the Support and Resistance limits. 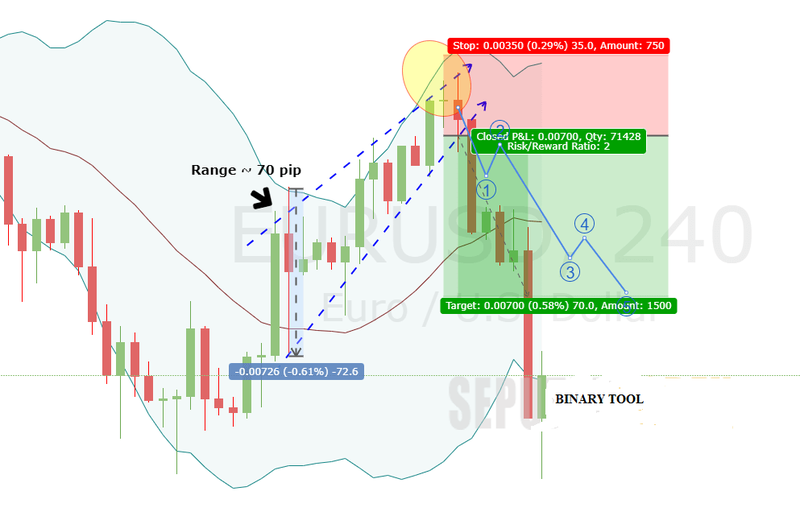 Because the profit target is set at 70 pips, the loss limit can be set at 35 pips (1: 2 ratio) or near the Upper Band of Bollinger Bands. As a result, the price actually went down and then touched the profit target in a relatively short time. 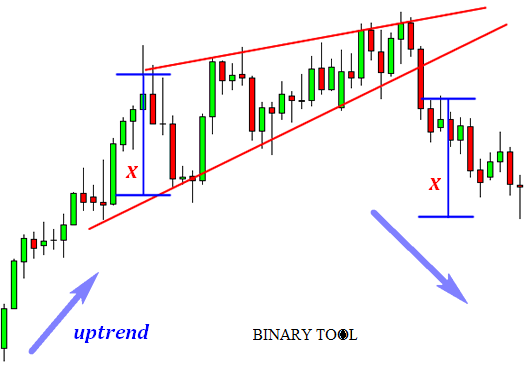 Trading steps using the Rising Wedge pattern above can still be developed or modified according to trading habits. For example, supporting indicators can be replaced with RSI, MACD, or other indicators that can identify at what point the trend will change. Like most price patterns, the two slice patterns are subjective. Because of this condition, the price pattern has high flexibility so that it can be used on all kinds of Pair and Timeframe. The problem is, because there are no definite benchmarks, the opening and closing positions will vary from one trader to another. 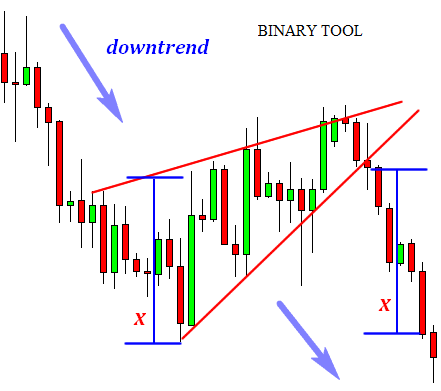 For example, one trader requires the use of this and that indicator to confirm the signal, but other traders don't even use any indicators other than Trendline lines to highlight the formation of a price pattern. Both have the opportunity to get big profits, even though the approach to the Entry and Exit regulations is different. 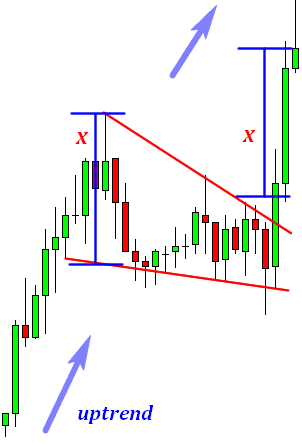 Because of its high flexibility, the Falling Wedge and Rising Wedge patterns offer the possibility of setting a trading system almost unlimited. For this reason, all traders, from beginners to professionals, can use both slice price patterns to get a reliable trading signal.